How often do we see a lovely shrub or perennial in a friend’s garden and just wish we had one like it? And with a little skill, ingenuity AND your friend’s permission, there’s no reason why you can’t have one or more the same. A word of caution here though, to avoid spreading weeds make sure that you don’t propagate anything you can’t identify, and ALWAYS ask permission. It is very frustrating for proud gardeners with attractive shrubs tumbling over their garden fence to find pieces constantly being ‘ripped’ off by passing walkers. The plant will suffer from needless brutalisation and the ‘cuttings’ may not actually survive the damage of being torn from the parent plant. So just ask! A cutting is the term we use for lengths of plant material being used specifically to propagate new plants. In contrast to growing plants from seed, where we may get plants that are slightly different from what we expected, cuttings will always be clones of the parent plant from which the cutting was taken. So a camellia cutting from a plant with a pink and white flower will produce another identical camellia with a pink and white flower. If you were to take the seed from that same parent camellia you would not be guaranteed to get a camellia with a pink and white flower. Nature has a tendency to play games when growing from seed, all in the name of maintaining a healthy gene pool, of course! These terms relate to the period in the growing cycle when the cutting is taken. Softwood Cuttings are generally taken in spring and early summer when the plant is putting on its new growth and there are a lot of growth hormones in the plant system. Soft wood cuttings usually strike (start to grow roots) relatively quickly. Chose slightly firmer pieces of plant material and avoid very soft sappy growth. Softwood cuttings generally benefit from the addition of some heat (mentioned further on). Semi-hardwood Cuttings are taken mid- summer after flowering when the plant is putting on new growth and starting to harden. They strike quickly and give good results without the need for additional heat. Hardwood Cuttings are generally taken at the end of summer and take longer to strike than those taken earlier in the season. However as this period coincides with the garden’s Autumn pruning, particularly of perennials, it is easy to source cutting materials. And with so much cutting material available, even if some fail, most will be ready to plant the following spring. All perennial and shrubby plants provide excellent potential for cuttings. The most successful plant material for cuttings comes from the ‘square’ stemmed plants eg from the Laminaceae family. This includes salvias, mint, rosemary and many other herbs. Many of the perennials in the daisy family, like Federation Daisies, also do well from cuttings however other daisy plants, like Echinacea sps, are best propagated from root division. The preferred cutting length is about 10cm to 12cm with at least 2 to 3 nodes on each cutting. The lower cut should be on an angle just beneath the first node. You can also ‘nick’ the area just beneath the lower node taking care not to damage the node itself. This node will be below the soil surface and this is where the root zone will develop. The top cut should be made above the next node (or the one above). 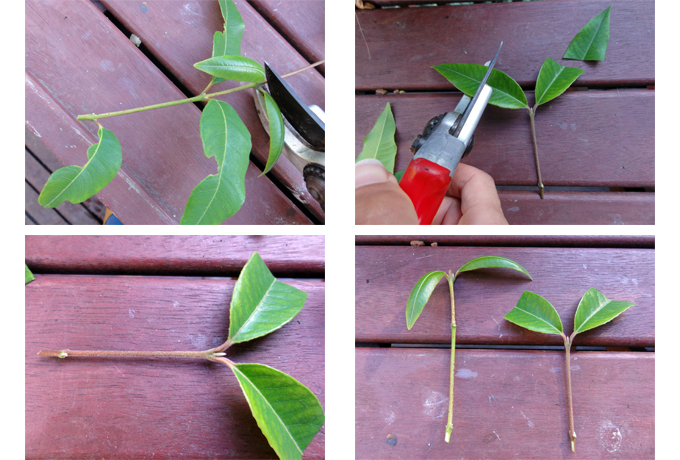 The entire cutting length should contain 2 or 3 nodes in total. These upper nodes will be where the leaves of the new plant will shoot. 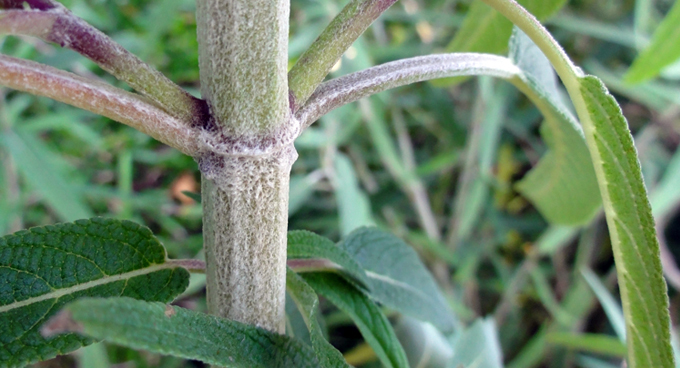 Take care not to damage any of the nodes along the cutting length. Plant nodes have the amazing ability to produce either roots or leaves depending on whether they are above or below the soil level which is why cuttings are so effective. The lower node may be dipped in a ‘rooting hormone’ if desired although if a lower strike rate is acceptable this is not essential. For a natural rooting hormone you may try dipping the cutting in honey. Reputably pieces of willow (an introduced species) soaked in water for about 10 days produce an excellent rooting hormone. This may be why they have been so successful at colonising our river banks and become serious environmental weeds!! If using this willow method, dispose of the willow pieces carefully so as not to increase their weedy spread. And yes, they probably will be still viable even after 10days in a bucket of water! Avoid taking cutting from any plant when it is in flower as these cuttings will have less potential for success. 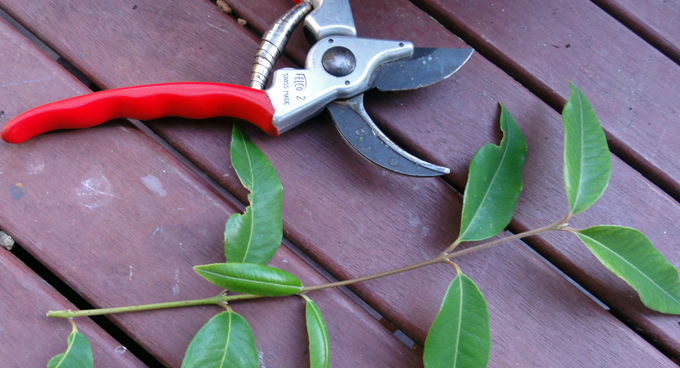 If the cutting has broad-leaf leaves, eg feijoa plants remove all except the top two leaves. If the top two leaves are very large, they can be cut in half laterally so the cutting doesn’t lose too much moisture through the leaves. 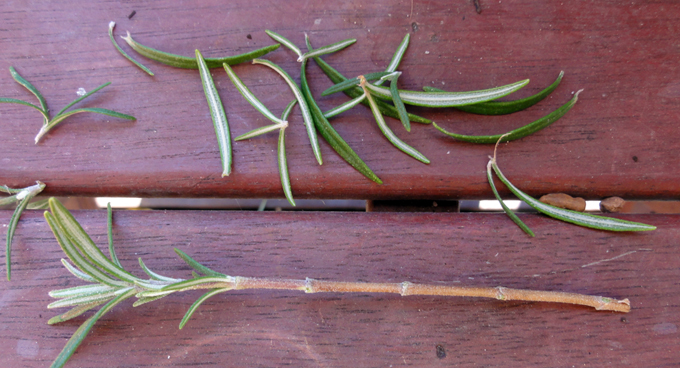 If the cuttings have multiple narrow small leaves, eg lavender and rosemary, remove the leaves on the lower 2/3rds of the cutting. The multiple nodes left all have the potential to produce roots when they strike. Cuttings do best in a free draining mixture so that they don’t rot. It is best to put lots of cuttings in the same pot rather than single cuttings in many post. The warmth and humidity of having them all clustered together will help them to strike. To increase the warmth and humidity, and maintain heat overnight, if possible cover the pot with a clear plastic ‘hood’ or the end of a polystyrene bottle. If doing this, keep the pot out of direct sunlight so that the air inside in the pot doesn’t heat up too much and ‘cook’ the cuttings. Mist the cuttings regularly to help regulate the temperature and keep a moist environment. Leave the cuttings in the pot long enough for them to establish strong root systems. Remove any cuttings that start to look like they have failed so that you don’t allow rots and fungal problems to enter the pot. They will usually look weak, brown off and begin to rot at the base. You can generally tell when the cutting has taken if it starts to put on new leaves and to grow. However be patient as the roots may take longer to develop. Continue to water the cuttings until you are ready to pot up. You can test for roots by gently rocking the cutting. If you feel no resistance, then the roots have probably not yet developed. When you think the cuttings are ready to pot up, tip the pot gently upside down and remove all of the contents together. Lay on a piece of newspaper and gently start to disentangle the roots. It is important to minimise the damage to these young roots as the vigour of the new plants depends on a strong root system. Pot the young cuttings into small pots with a good quality potting mix. Water in with a weak solution of seaweed fertiliser or worm leachate tea. Put the cuttings in a sheltered spot to ‘harden off’ before gradually introducing them to a more open environment. Once the root mass of the cutting starts to fill its new pot, either pot on again or, if the conditions are suitable, plant into a prepared garden bed. And enjoy the fruits of your labour for years to come! Many new plant cultivars that have been developed over the past decade may be subject to Plant Breeders Rights (PBR). PBR is effectively a plant patent. You may propagate these plants for your own use but NOT for resale unless you pay a royalty to the PBR holder. If in doubt, check the original plant label or seed packet or look for the PBR symbol.